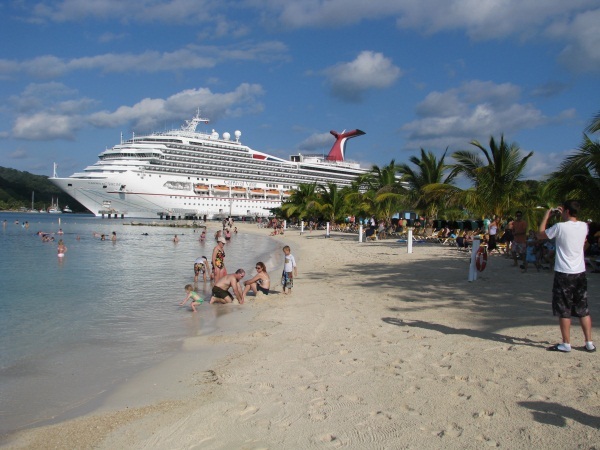 Mahogany Bay Roatan- The Carnival Cruise Ship Port | We LOVE Roatan Blog!! It is easy, if you just want to get off the ship, stretch your legs and hang out at a nice looking beach without spending much money this is your best option. Great shopping for Roatan souvenirs. You are not really seeing Roatan, just a man made center which caters to the mass market. There is no comparison between the beach and reef and Mahogany Bay and West Bay Beach. It is difficult to leave the port by walking as it is built deep inland. The port can get extremely crowded and it feels a bit like Disneyland. Prices are higher for food and drinks.